Tobii Rex, the eye-tracking peripheral for PCs, has the opportunity to make touchscreens look "so 2012" at CES 2013 next week. That's where Swedish developer Tobii Technology plans to show off its latest forward-looking Windows 8 eye-controlling technology. According to the company, the device is being marketed toward everyday consumers instead of impaired individuals. 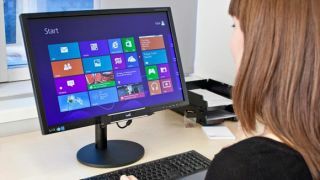 The reason for the broader scope is that the monitor-mounted Tobii Rex functions in tandem with mouse, touch and keyboard controls to get the job done. With proper calibration, a person's eye gaze can zoom, scroll, auto-center and open windows thanks to this pen-sized USB device that adheres to the bottom of any desktop computer monitor. The Tobii Rex that is intended for consumers is currently pegged with a fall 2013 release date, according to PC Magazine. Tobii Technology plans to make 5,000 of these limited-edition peripherals in the next year, but it hasn't announced a price for this desktop-only consumer version. The company said that a Tobii Rex developer's kit is available right now for $995, and that it will work on laptops in addition to desktop computers. The official website for Tobii Technology is also having "interested parties" sign up to receive a forthcoming VIP invitation to put down money for the Tobii Rex 48 hours before the general public pre-order. A pre-pre-order if you will. Tobii Rex isn't the only eye-tracking device that will catch the eye of consumers in 2013. Recently, Google patented eye-tracking technology for its much-hyped Google Glass prototype. However, Tobii Rex has been in the eye-tracking game for a several years now - so long that the company actually made the first eye-controlled video game called EyeAsteroids. The company has also previously developed an eye-tracking tablet and partnered with Lenovo for an eye-controlled laptop.